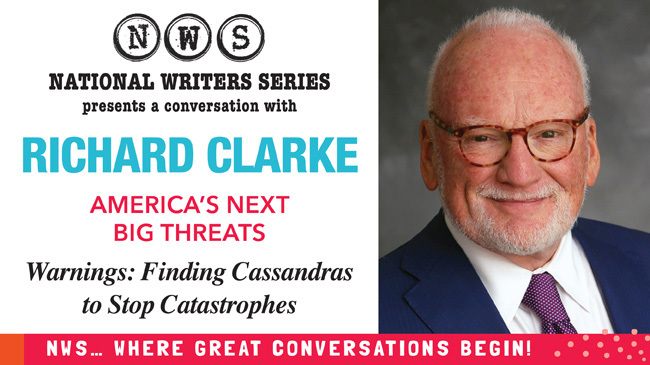 The National Writers Series' second round of author events for 2018 continues with Richard Clarke, discussing his book Warnings: Finding Cassandras to Stop Catastrophes. Here’s your chance to sit down with Richard Clarke, advisor to four presidents and one of the few to warn about Osama Bin Laden’s impending attack. He’ll talk with host Jack Segal about cyber threats to national security and his co-authored book, Warnings: Finding Cassandras to Stop Catastrophes. You can get your tickets for the event just down the street at The City Opera House.